It is the 2011 Ultimate Blog Part hosted by 5 minutes for mom. This is my first Blog party experience and I am nervous! Thanks 5 minutes for mom for doing this great party for us blogger mommies! Let me tell you a little bit about how I decided to start this blog. I started back in July of 2010. I was constantly helping out friends and family with diaper coupon deals and diaper points for both Huggies and Pampers. I was constantly sending emails and messages on Facebook. I looked at my husband and told him there had to be a better way to do all of this and I wonder if by putting it on a blog it would make it easier to get the information to people that want it. That was when “Ally’s Helpful Hints for Mommies” was born. What does “Ally’s Helpful Hints For Mommies” have to offer you? My main focus is of course mommies. I will post all diaper codes I find and diaper and wipes deals I see and find. I also have hints for craft projects for grandma and grandpa that are fun and inexpensive and fun things to do with your kids. If I find a fun or inexpensive way to do something I will let you know. I also post some freebies that would be helpful for mommies. We also have some fun with a a giveaway here and there from people who donate a prize for my readers. On my Facebook page we share questions and fellow mommies help us get answers. I want to create a place where mommies are comfortable to come and ask and get answers to questions they may have. I love to help mommies but I need help too and I am thankful for a wonderful group of supportive mommies that read my blog. Who is behind “Ally’s Helpful Hints For Mommies”? My name is Allison I am a 37 year old stay at home mom. Ironically everyone I know calls me Allison and not Ally. 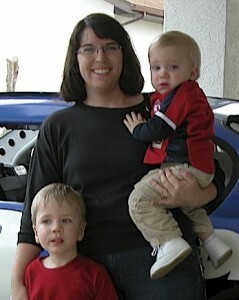 I am a wife and mommy to two boys 3 1/2 and 1 1/2. We enjoy living in the sunny state of Florida and admittedly we love technology in our home and having fun on my blog is a great hobby for me. Would love for you to come back and visit again! Thanks for dropping by! You can follow Ally’s Helpful Hints for Mommies on Twitter HERE and also on Facebook HERE!